A variety of wooden fence types, such as privacy fences and picket fences, are based around pre-fabricated panels that greatly simplify the process of erecting the fence. Sometimes it is necessary to remove and replace damaged panels, to temporarily take down panels so as to admit wagons and other items too large to come through the fence gate, or to simply create a more convenient point of entry. In most instances, circumstances require removing the fence post with care, rather than simply tearing it out. 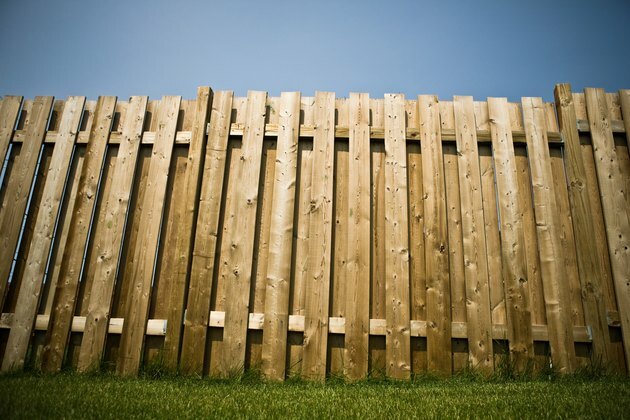 Privacy fences are made from wood panels. Examine any point where the horizontal rails of the wood panel meet the fence post, as this is where the panel is fastened to the post. In most instances, the rails of two adjacent panels meet in the middle of a given post, except corner posts and gate posts. Determine whether the post is fastened by nails or screws. Hit a horizontal rail with a rubber mallet to drive the panel in tighter against the fence post, to expose the head of the two or three nails holding it in place without damaging the wood. Pull out the nails with a pry bar or claw hammer. Repeat for every point where the rails are fastened to the fence posts on either side. If the panel is fastened with screws, skip to Step 3. Unscrew those screws holding the rails of the wood panel to the fence posts on either side. Lift the wood fence panel and set it aside.